The Philadelphia Eagles clinched their first Super Bowl triumph by edging a high-scoring thriller against defending champions the New England Patriots in Minnesota on Sunday. n a game featuring over 1,000 offensive yards, Philly denied the Pats a third title in four years by winning 41-33. Here we look at five things we learned from Super Bowl LII. Philadelphia's triumph was all the more impressive given it was achieved with back-up quarterback Foles. Only playing due to starter Carson Wentz's injury, Foles was the Super Bowl MVP after throwing three touchdowns and catching another on a gutsy trick play. Wentz was superb before his season was ended so will surely take his spot back next term but Foles, who has one year left on his deal, could now be an attractive trade proposition for a quarterback-needy team. 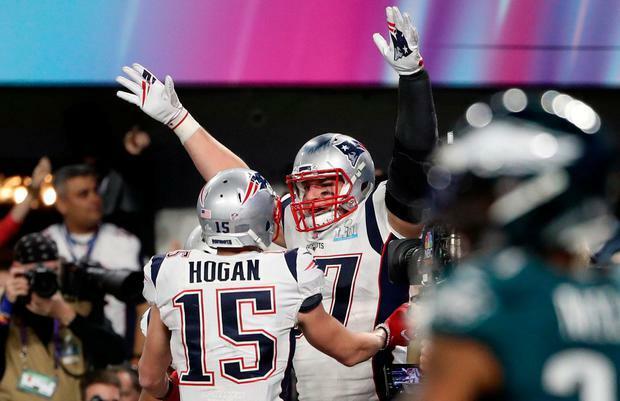 The most memorable moment of Super Bowl LII was the fourth-and-goal call at the end of the first half. Not only did Pederson roll the dice with his team 15-12 up, the Eagles also increased the risk with a play that resulted in Foles' first career reception for a Super Bowl touchdown. It was executed to perfection with tight end Trey Burton making the throw and it gave Philadelphia a 10-point lead at the break so Pederson deserves plenty of kudos for his aggressive approach. At the end of a week where NFL commissioner Roger Goodell had said the league needed to review its definition of a completed catch, there were a pair of contentious calls that both went Philadelphia's way. A review upheld Corey Clement's touchdown, despite him appearing to bobble the ball before his foot went out of bounds, while Zach Ertz's late score also needed several checks before the call stood. Ertz was deemed to be a runner, therefore making his contact with the ground irrelevant as he had already crossed the goal-line with the ball. However, the confusion surrounding the regulations left the majority on social media perplexed. Tom Brady will likely be back - the 40-year-old quarterback has spoken of his desire to play until his mid-40s - while head coach Bill Belichick has previously indicated a willingness to carry on too. Yet tight end Rob Gronkowski, who caught two touchdowns on Sunday, revealed he will mull over his future following a series of injuries and New England could lose both of their coordinators to head-coaching gigs too. This might not be the end of the Belichick-Brady era but change could still be coming elsewhere. Three years ago cornerback Malcolm Butler was the hero as his interception near the goal-line sealed victory for New England when it looked like they were heading for defeat. In Minnesota he did not play one single defensive snap. Yes, Butler has not had a great season but the decision to play Eric Rowe instead was surprising, with the latter then beaten by Alshon Jeffery for an early touchdown. Belichick said Butler's absence was not due to disciplinary reasons so why was he still on the sideline as Foles continued to carve up the secondary? Independent.ie Newsdesk New England Patriots tight end Rob Gronkowski announced his retirement Sunday on Instagram, ending one of the league's most dominant and colorful careers after nine seasons. Eddie Pells Greying but still gritty, Tom Brady, Bill Belichick and the Patriots came to the Super Bowl intending to stave off, for at least one more game, the inevitable onslaught of the NFL's future.